Translucent rules have been in operation in New South Wales (NSW) for well over a decade. Water sharing and delivery regimes have changed over that time, including the introduction of the environment as a legitimate water user. On 6 July 2016, in response to community interest, the minister announced a review of the flow rules to check that they are usefully serving their intended purpose. The Translucency rules in NSW inland rivers - Scoping review ((PDF 2.6 MB)) (February 2018) report represents a stocktake of the current rules in inland NSW regulated rivers; their diversity and intended purpose and an overview of options and implications for change. What are transparent and translucent flows? 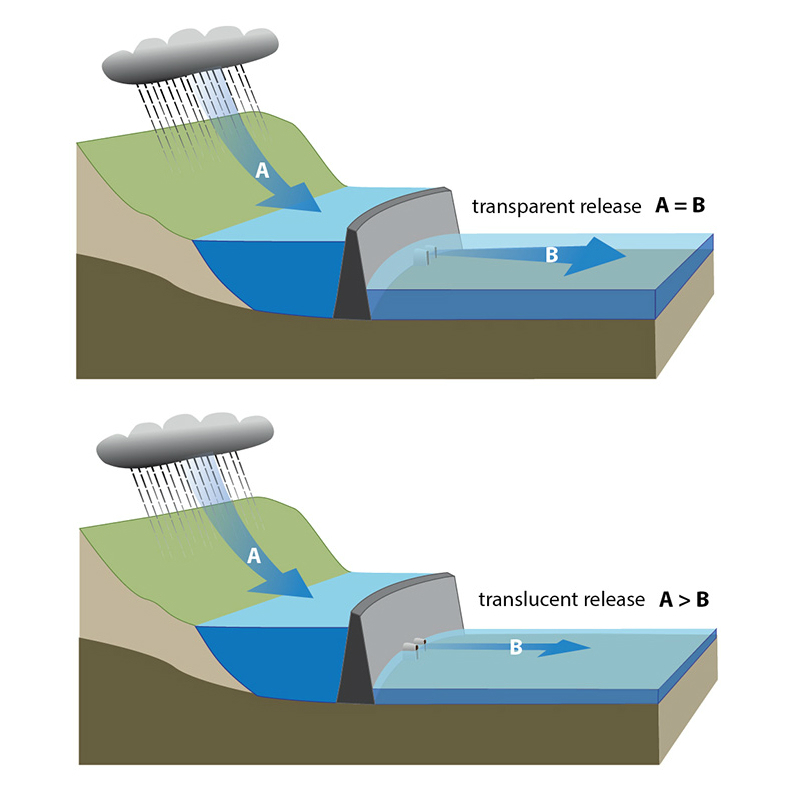 A transparent flow occurs in a regulated river system when inflows are passed through a regulating structure – usually a dam – to enable a near-natural flow pulse into the river system. A translucent flow is similar, however only a portion of the inflow volume is passed. This does not involve the use of licensed environmental water, but is instead a fixed rule that designates water to be made available for an environmental purpose under certain conditions. Such conditions trigger when releases are made, and in the case of translucent flows, determine the proportion of inflows to be released. These conditions could include a date range (usually winter/spring), catchment conditions (whether dry, normal or wet), environmental volume already released in the water year, current downstream inflows, existing storage volume, inflows to date, and inflow triggers. maintaining habitat and breeding conditions for native fish and waterbirds. These types of flow rules exist in several water sharing plans in NSW and generally operate quite differently to the active management of licensed environmental water.